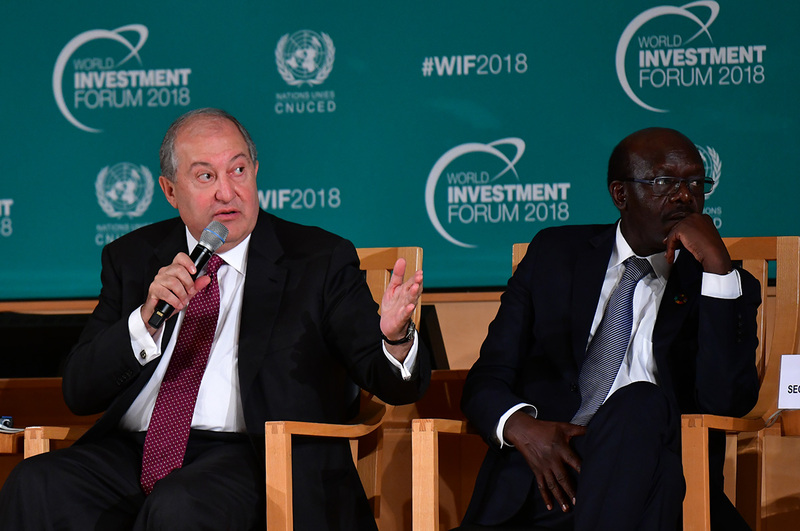 President Armen Sarkissian, who is in the Swiss Confederation on a working visit, in Geneva, at the UN headquarters participated at the official opening of the World Investment Forum 2018 organized biannually by the United Nations Conference on Trade and Development (UNCTAD). 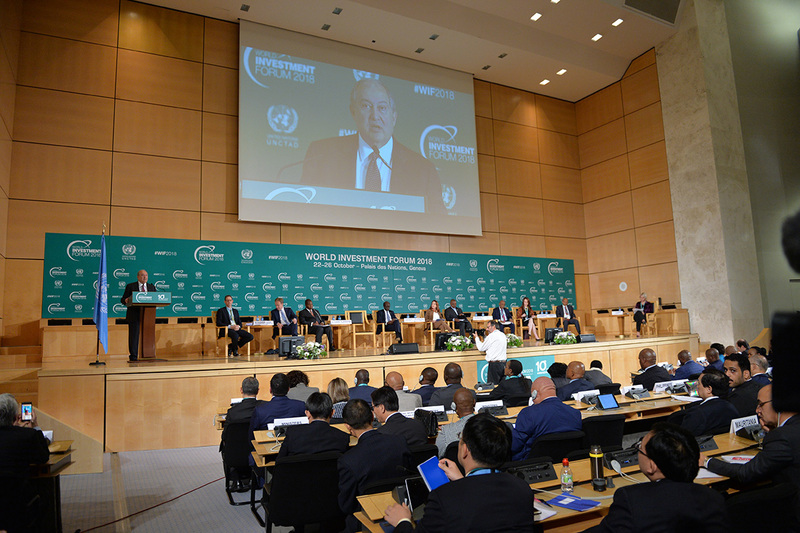 The 10th conference this year is titled “Investments for Sustainable Development”. 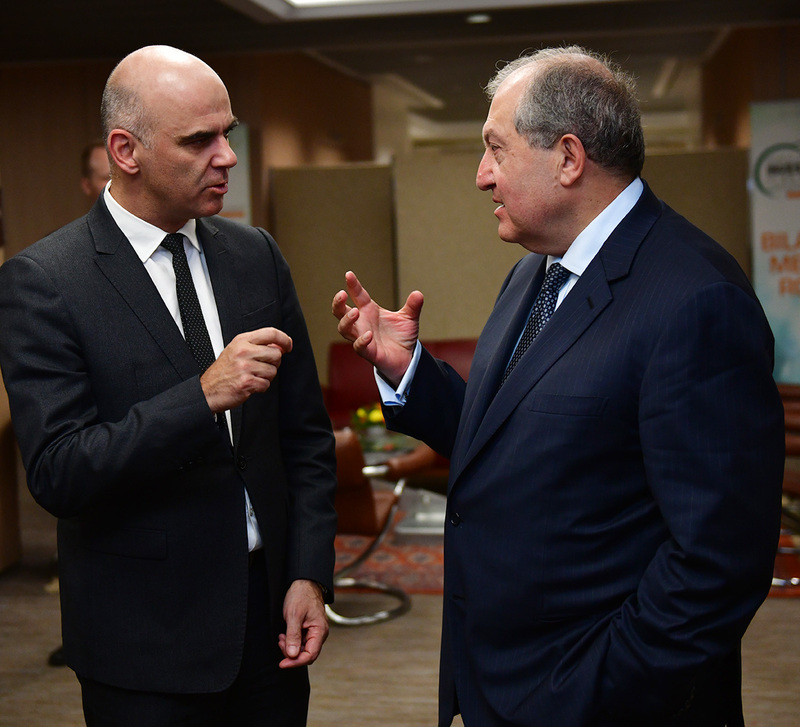 Before the opening of the Forum, the President of Armenia had a brief meeting with the President of the Swiss Conferation Alain Berset whom he met with also recently, in the framework of the 17th Summit of Francophonie held in Yerevan. 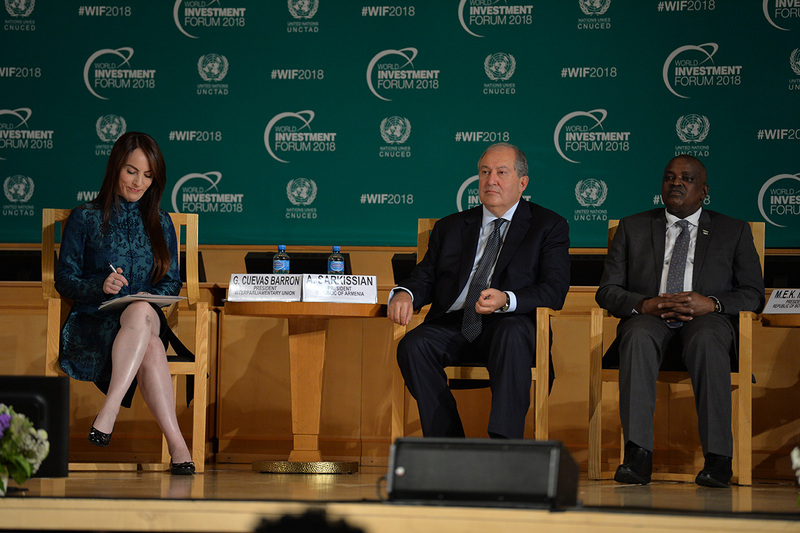 Present at the opening of the Forum were high-level officials from Switzerland and international organizations, members of the UNCTAD, representatives of the world business community, investors. 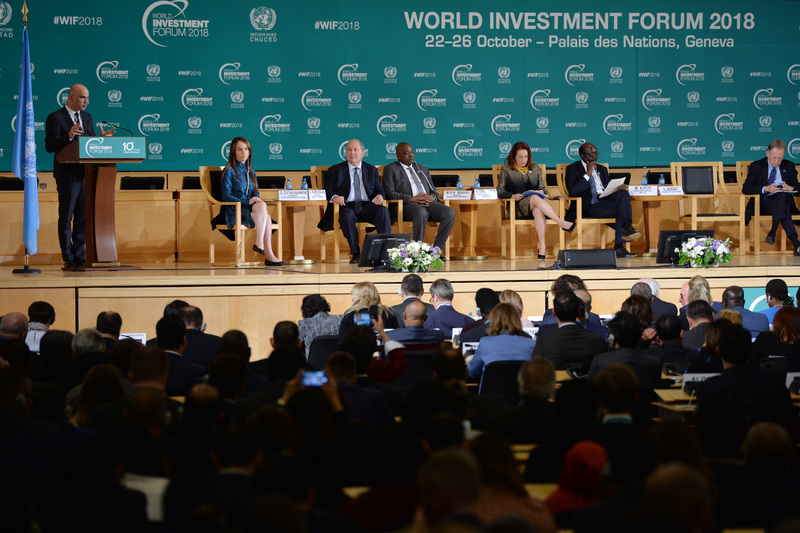 President Alain Berset welcomed the participants of the World Investment Forum 2018. 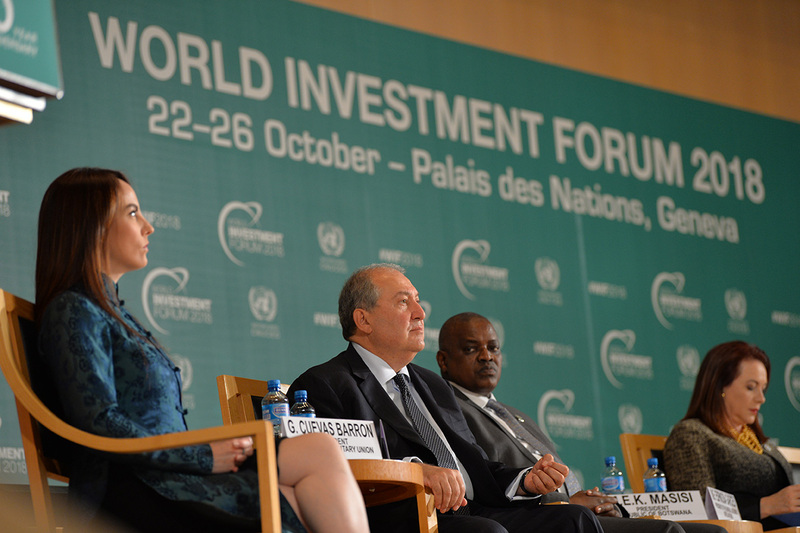 The World Investment Forum is one of the leading and prestigious international forums in the areas of investments and sustainable development, a high-level platform where new global challenges of globalization and institutionalization in the area of investments in modern times are discussed as well as avenues to overcome them. 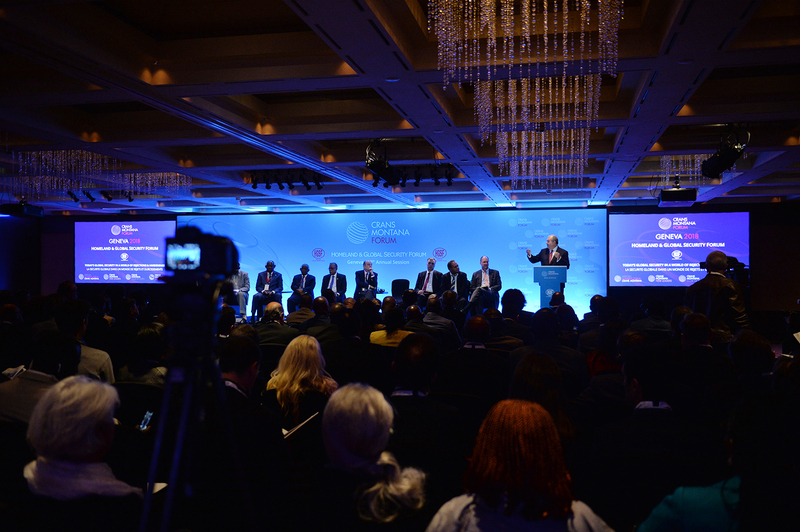 This year, the Forum has brought together over 4000 representatives from 160 countries, including multiple pan national corporations, influential investment funds, leaders of major companies. 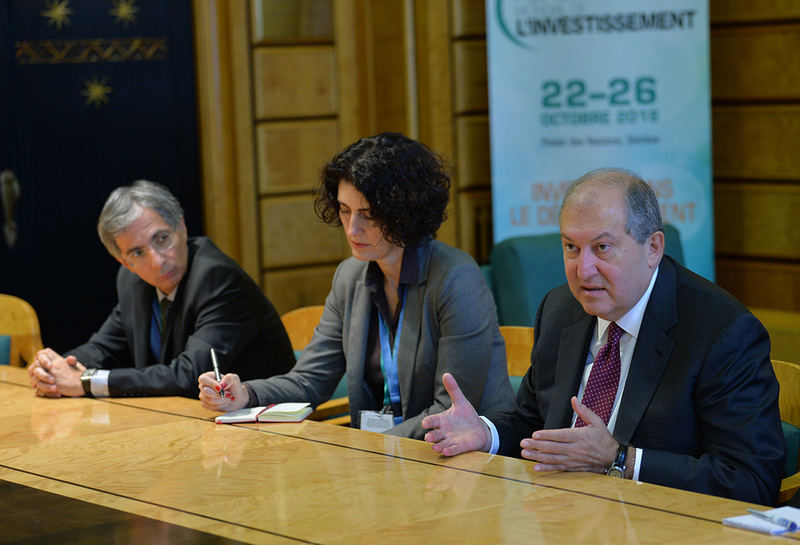 The opening of the Forum was succeeded by the UN Investment Encouragement award ceremony which was attended by President Sarkissian. 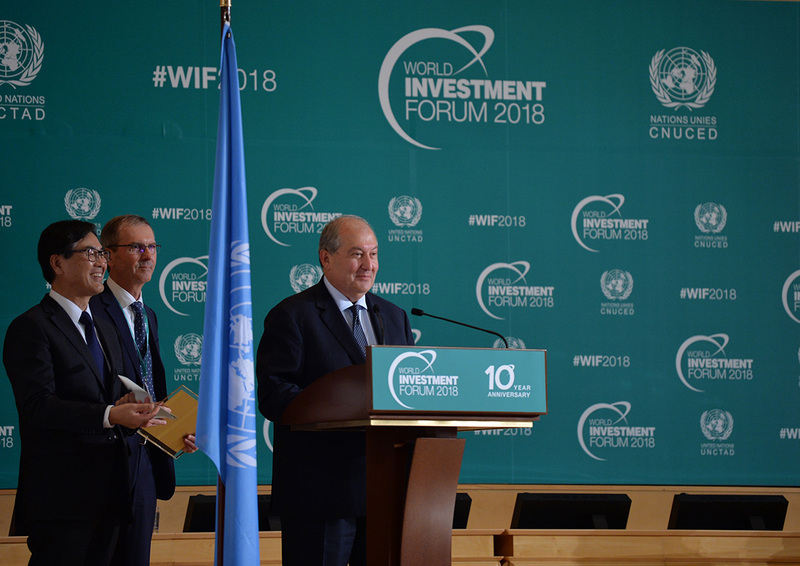 Awards were handed to the companies which have demonstrated excellent results in the UN proclaimed sustainable development goals, particularly, in fighting poverty, providing quality education and healthcare, and in the implementation of the programs to fight climate change. 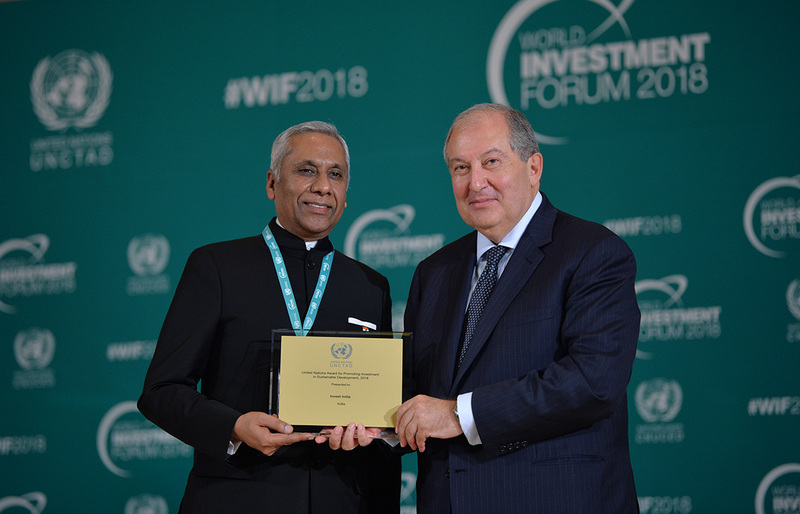 President Armen Sarkissian handed award to the Indian Invest India company. 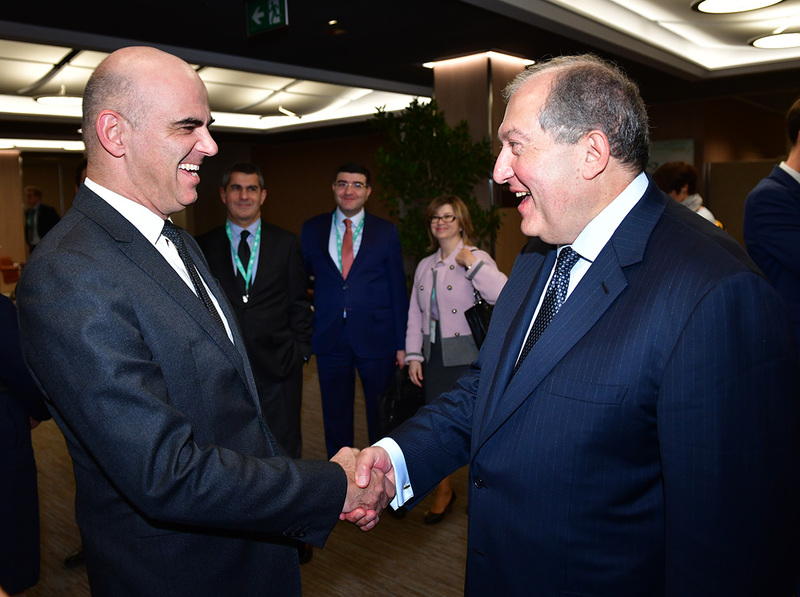 Later, the President of Armenia visited the Armenian pavilion at the Investment Village of the World Investment Forum. At the pavilion, along with our country’s investment climate, attractiveness and competitive advantages presented are also Armenia’s tourism opportunities and particularities. The President familiarized with the materials exhibited in the pavilion and conversed with the visitors. 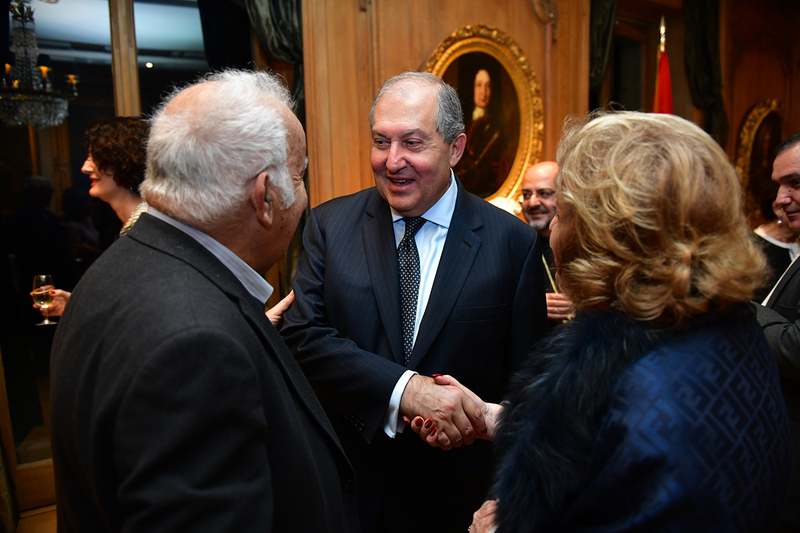 President Armen Sarkissian, who is in Geneva on a working visit, and Mrs. Nouneh Sarkissian visited the headquarters of Franck Muller company and met with the President of the company, the well-known Armenian-Swiss entrepreneur and benefactor Vartan Sirmakes. 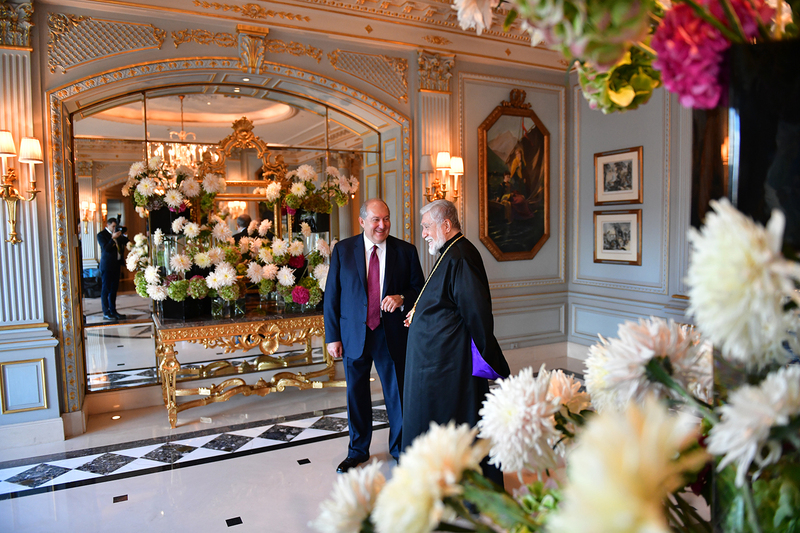 Accompanied by Mr. Sirmakes, President Sarkissian toured various divisions of Franck Muller, visited the exhibition and event center, familiarized with the ambitious development programs of the Company. 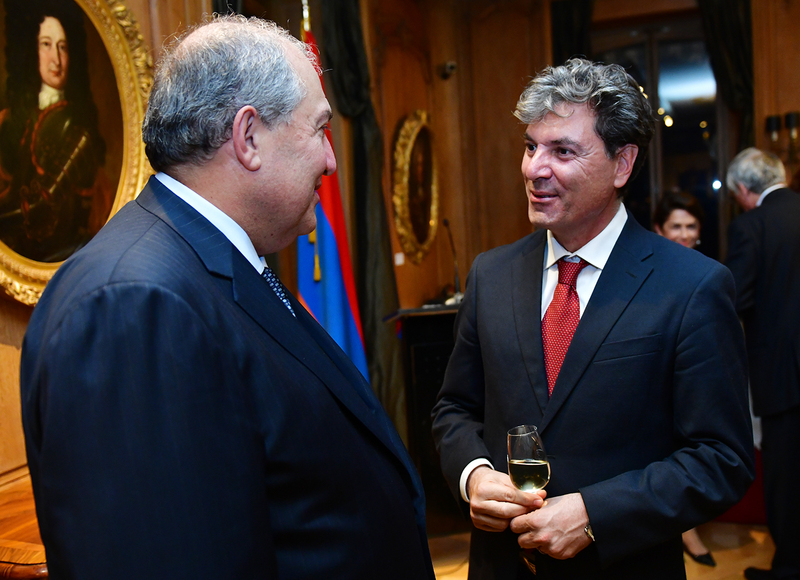 The President highly praised Vartan Sirmakes’s contribution to Armenia’s development, particularly his programs implemented in Armenia and Artsakh. 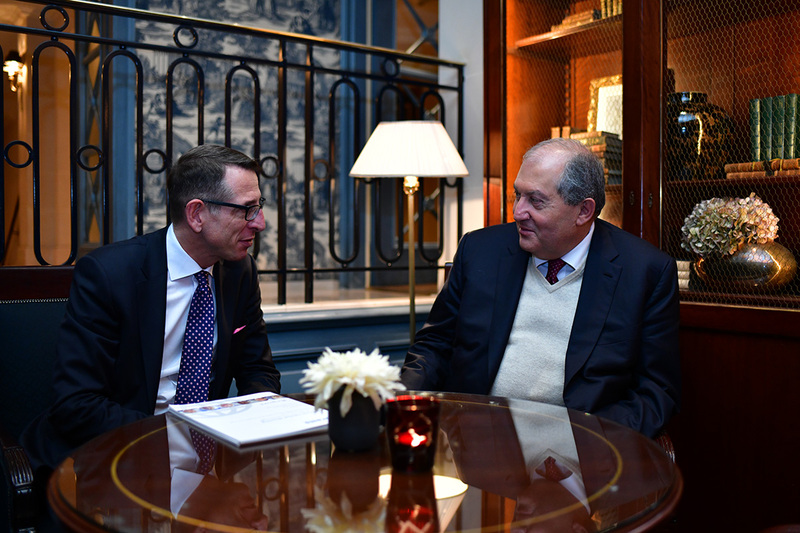 The Armenian-Swiss businessman in his turn noted that his sons and himself are ready to deepen their participation to the development of Armenia and Artsakh through various programs. 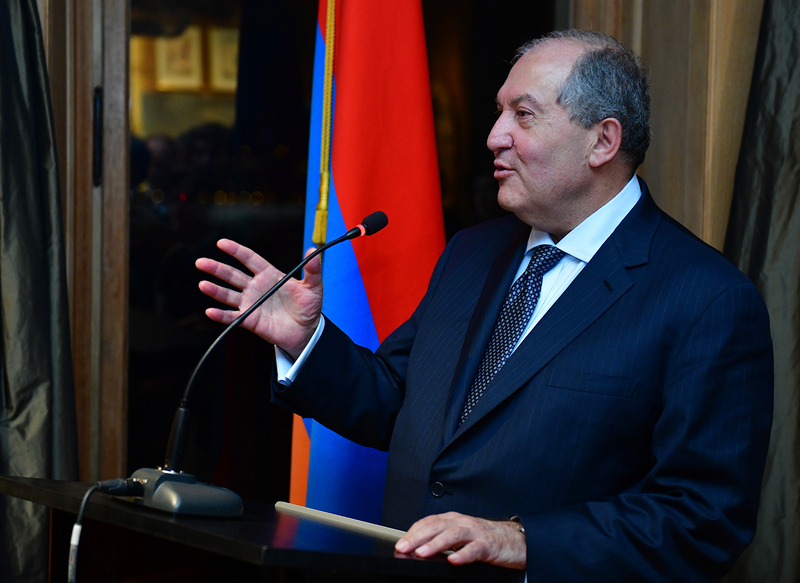 Noting that during his visits abroad, he sees it as his duty to constantly speak and tell about Armenia, President Sarkissian viewed as a paramount task making Armenia an attractive country for investors. 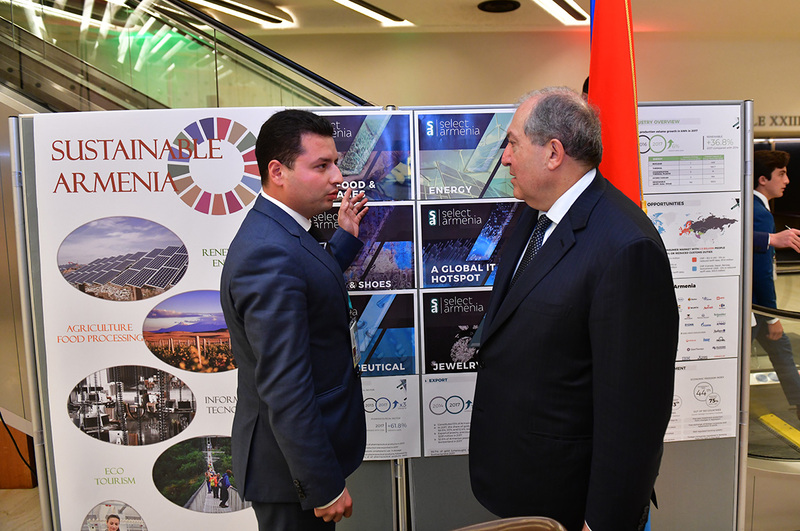 “We should be able to build a stable and predictable state where long-term programs can be designed and implemented successfully,” the President of Armenia underscored. 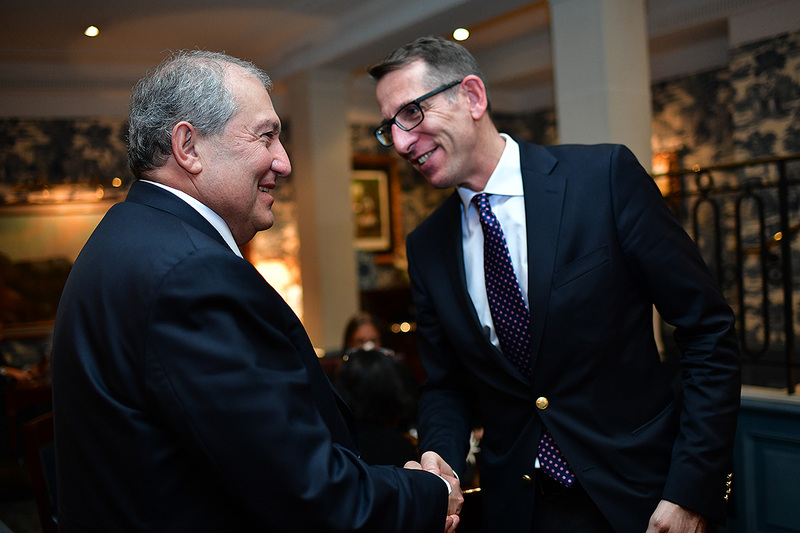 He also stressed the importance of Diaspora young generation’s strong ties with Fatherland and their involvement in Armenia’s development programs. 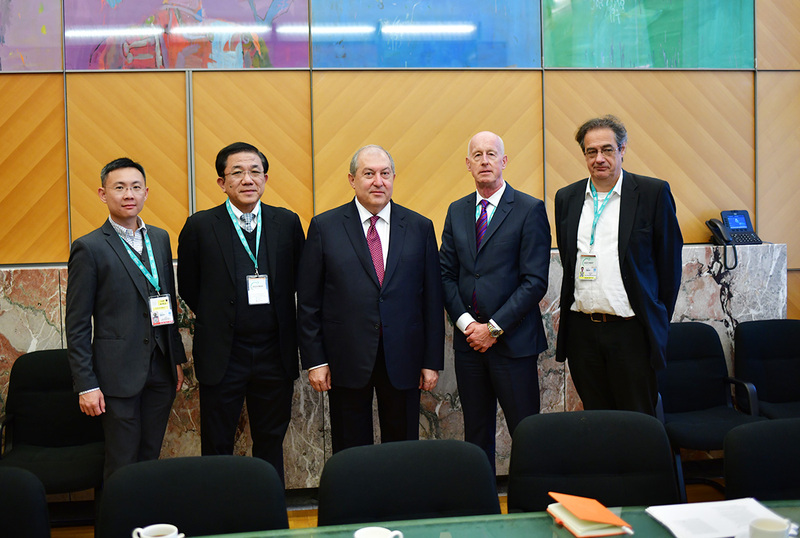 In Geneva President Armen Sarkissian had a meeting with the leadership of the largest venture company from Singapore Vertex Venture Holdings, Swiss Sustainable Finance company from Switzerland, renowned German Siemens company which is a member of the Siemens Financial Services group. The purpose of the meeting was to present to foreign partners Armenia’s investment field, prospects of cooperation in different areas. Discussed were issues related to a productive cooperation with the mentioned companies. The parties also spoke about introducing their experience in our country as well as opportunities to implement projects with the Armenian companies. 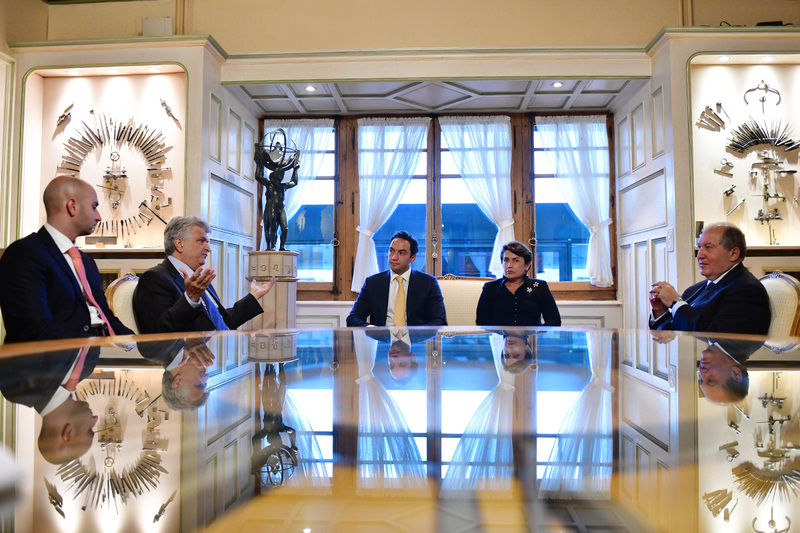 In particular, the agreement was reached to visit Armenia and hold discussions on cooperation with the RA government. 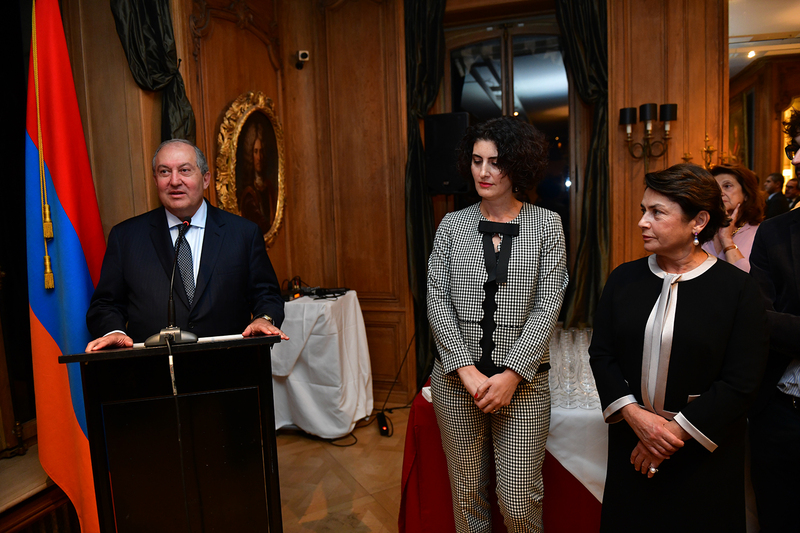 The President of Armenia introduced the most rapidly developing and promising areas of the Armenian economy. 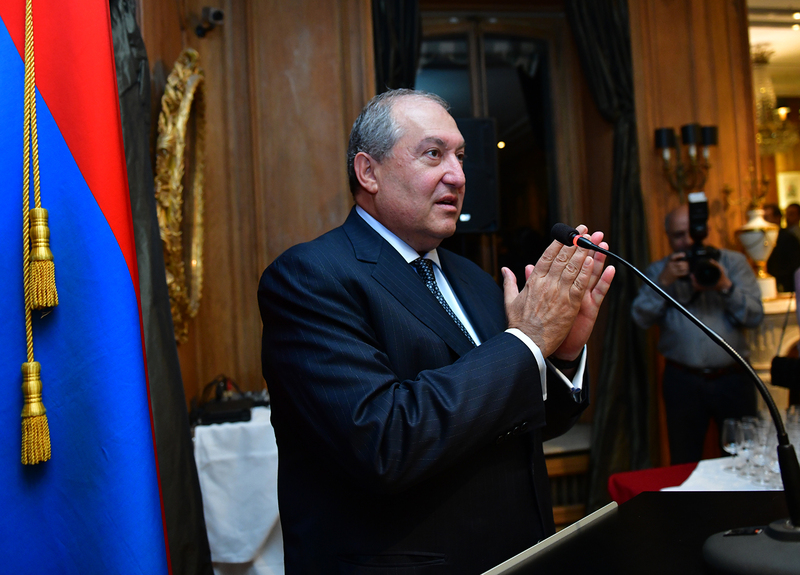 President Sarkissian noted that Armenia, as a member of the EAEU, could become a very important hub between the EU and EAEU member states, considering that all prerequisites are in place. The Vertex Venture Holdings is a world venture fund company which is focused on venture investments in the areas of information technology and healthcare. The Swiss Sustainable Finance unites 110 member and partner organizations, including Swiss banks. 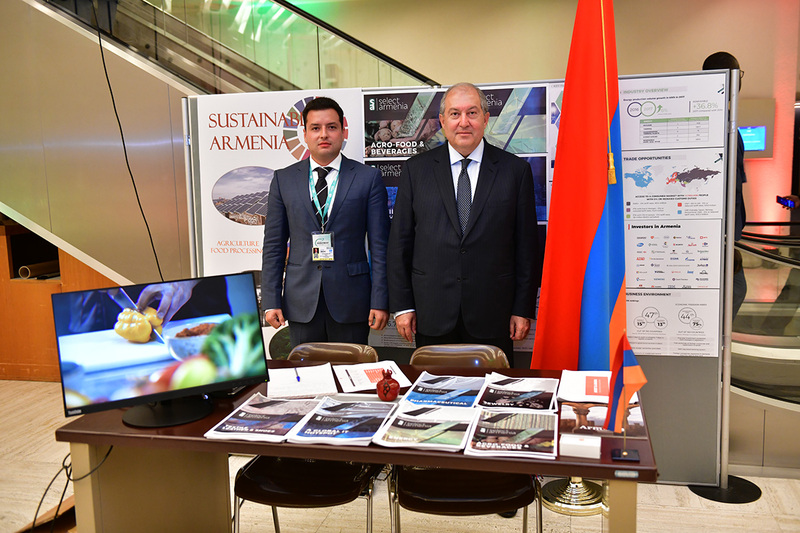 Its activities are aimed at “clean economy” and development of clean industry which is an essential issue for Armenia. 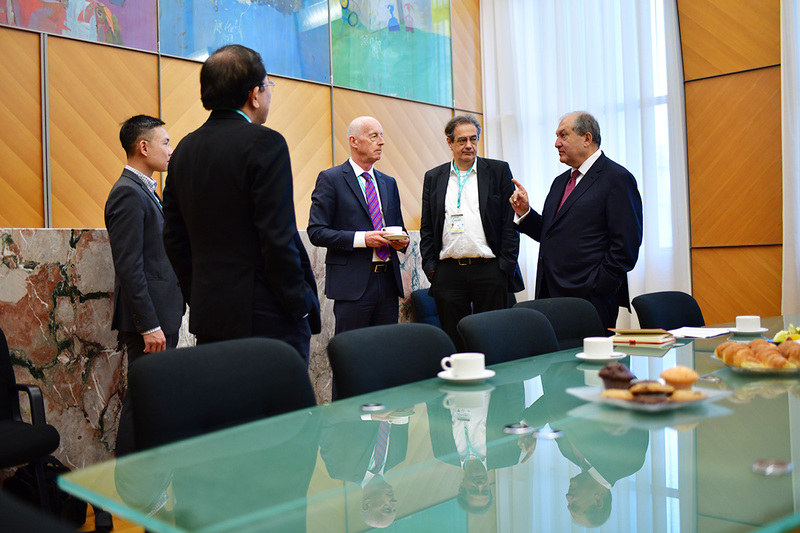 With the Siemens Financial Services company discussed was a wide range of issues pertaining to the cooperation in the energy, industry, infrastructure areas. It was particularly noted that Armenia, as a member of the EAEU could become a bridge to the Eurasian markets. 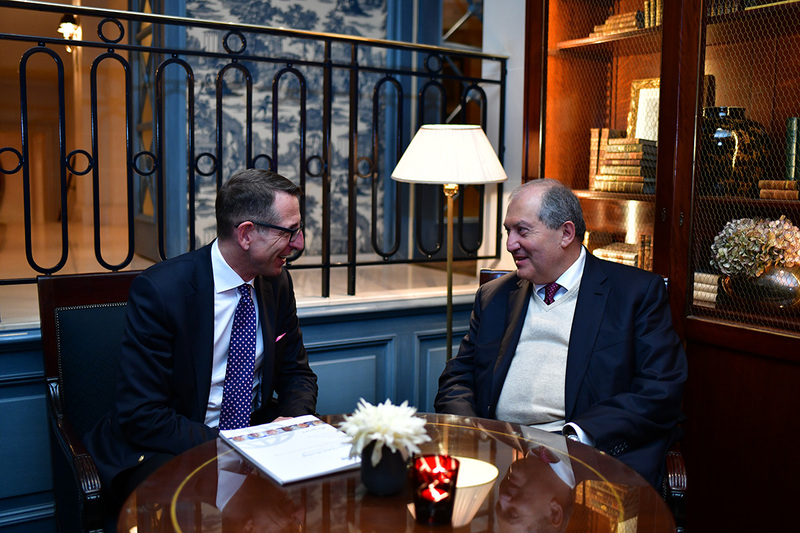 In Geneva, President Armen Sarkissian met with Frank-Jürgen Richer - a German entrepreneur, founding director of the Horasis Center which is operating in Switzerland. 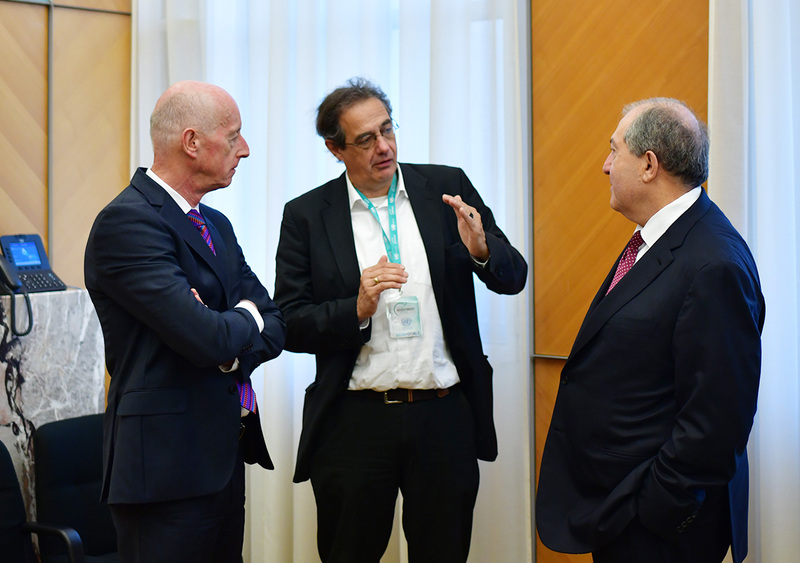 Horasis is an independence analytical center which organizes meetings and proposes strategic solutions for the challenges which our world and corporations are facing today. 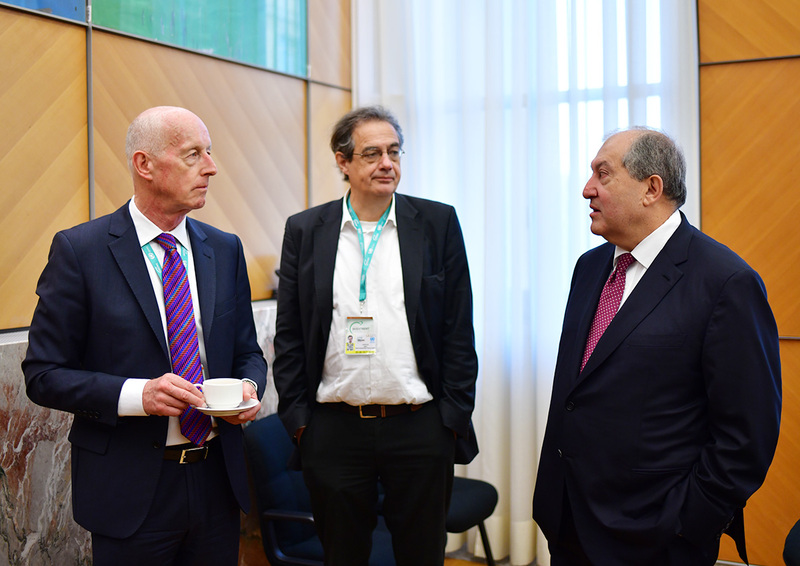 Among participants of the Horasis events are well-known public figures, including heads of state and government, presidents of international corporations. 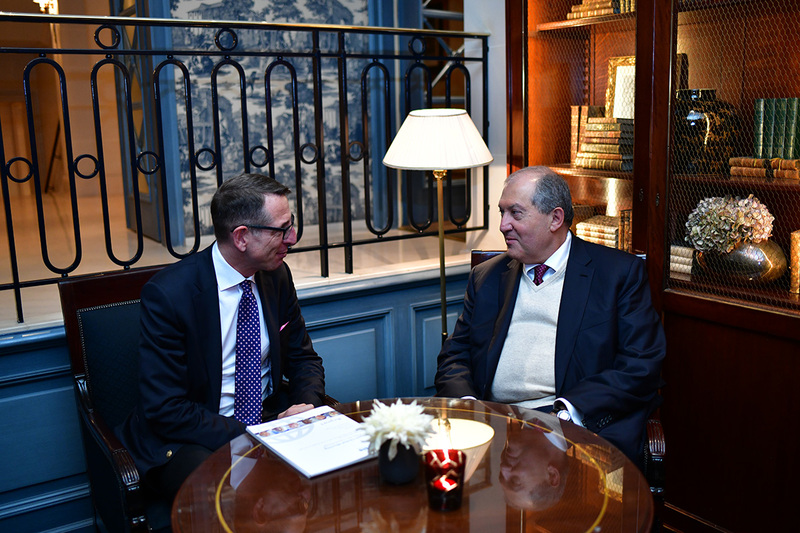 Frank-Jürgen Richter offered the President of Armenia to become a special speaker at the annual of Horasis gathering which will take place next year, in Portugal. 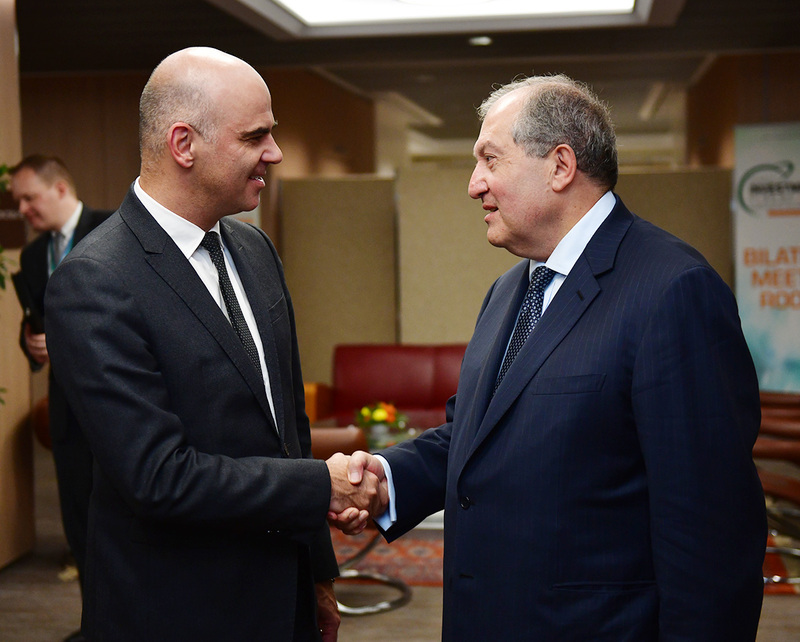 President Sarkissian, in his turn, proposed Horasis to look into the possibility of conducting one of the upcoming meetings in Armenia. The parties stressed also the importance of cooperation with the Armenian analytical centers as well as implementation of joint programs in the area of education. 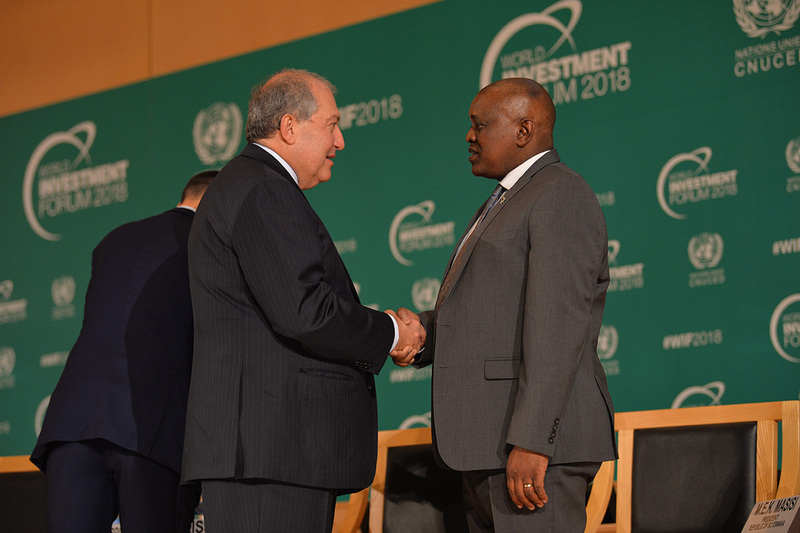 President Armen Sarkissian, who is in Switzerland on a working visit, on October 24, in Geneva met with the Secretary General of the United Nations Conference on Trade and Development (UNCTAD) Mukhisa Kituyi. 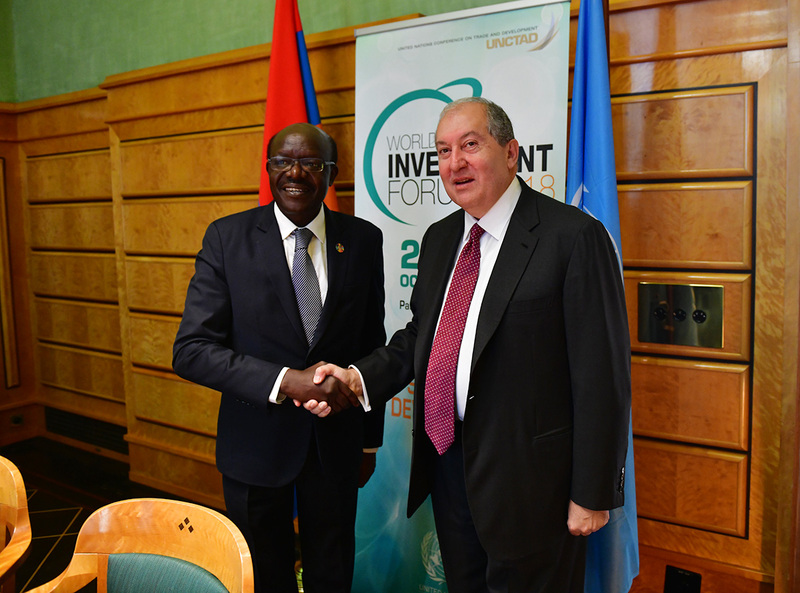 The President of Armenia stressed the importance of the UNCTAD’s assistance to the economy of our country. 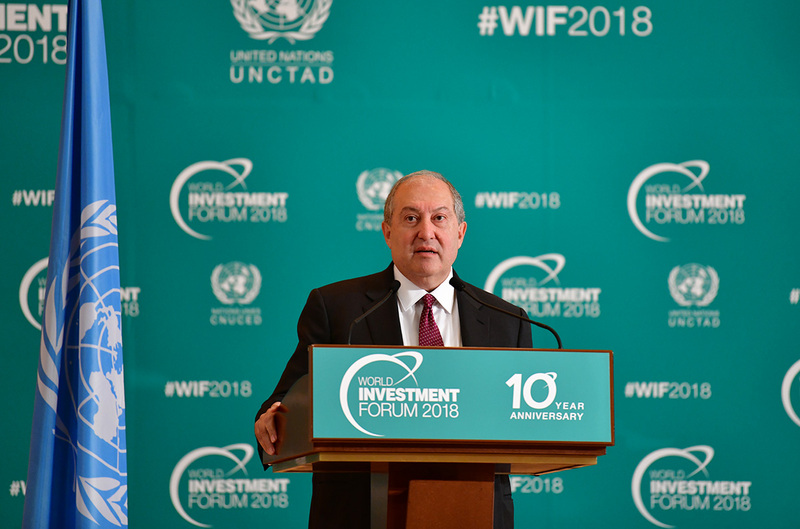 Noting that in different areas of economy, such as information technologies, education, and agriculture Armenia possesses great potential and ambitious programs, President Sarkissian said that our country anticipates active participation of the international financial institutions to the implementation of various programs. 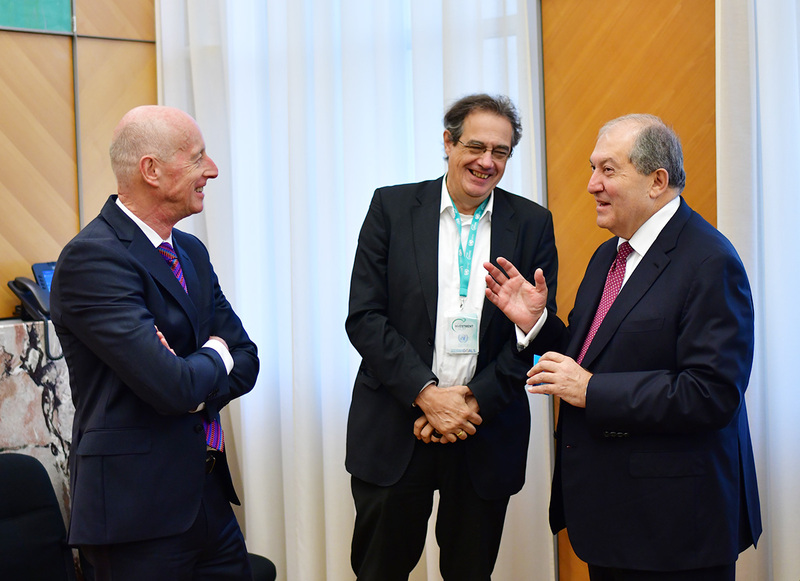 The Secretary General of UNCTAD in his turn hailed Armenia’s growing participation in different programs. 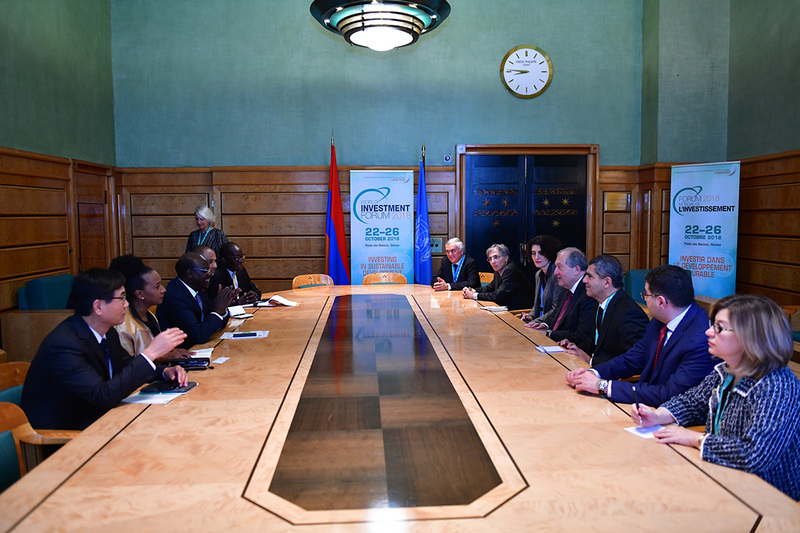 At the meeting, the parties discussed Armenia’s investment policies, external debt management, and issues related to the deepening of cooperation. 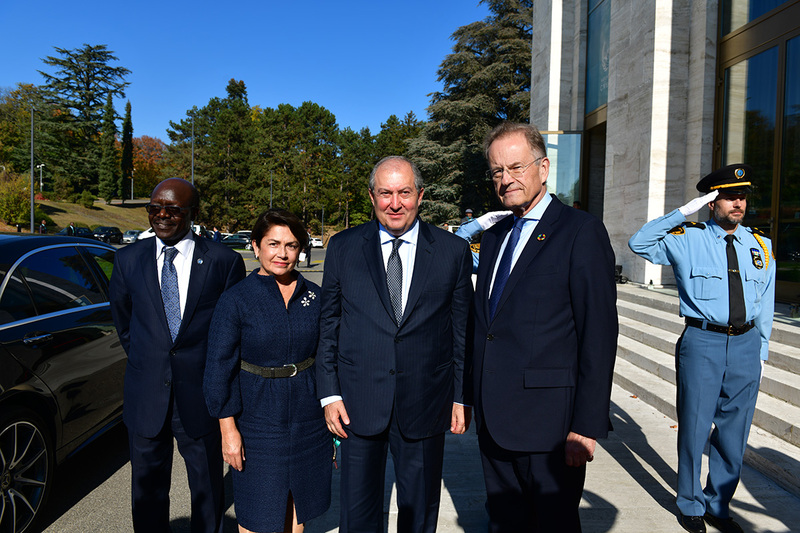 President Armen Sarkissian, who is in Switzerland on a working visit, made a statement at the Global Leaders’ Summit held in the framework of the Forum. The President of Armenia in his statement noted in particular that our country for centuries has been at the crossroads of civilizations, religions, interests and trade and has had an important role in the cooperation of the nations. 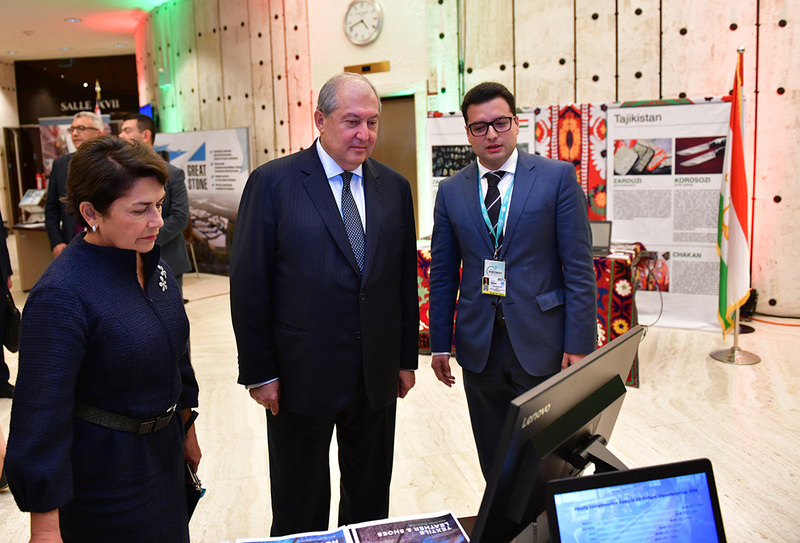 Speaking about the prospects of Armenia’s economic development and investment opportunities, President Sarkissian noted that years ago, the fourth industrial or digital revolution took place in Armenia, and today one can state definitely that Armenia has the best IT sector on the territory of the former Soviet Union. A number of major companies from the Silicon Valley and Europe have their representatives in Armenia. “Why should someone think about investing in a country like Armenia, a small country of only 3,5 million people? I would like to remind that the reality is that it’s a small state but a global nation. There are 4-5 times more Armenians living abroad. There are as many Armenians living in Russia as in Armenia. There are as many Armenians living in our capital city as in Los Angeles, or in France, or in the Middle East. So there is huge population, it’s a small state but a global nation which in the 21st century is a great advantage. In the 21st century, when the world is becoming smaller and smaller, interconnected and interactive, having a global network, which not many states and nations of the world have, is an advantage. The second is that we are a state that has very good relations – cultural, economic, political, and we signed in November 2017 the Agreement with the European Union. At the same time, Armenia is a part of the Eurasian Economic Union. Factually, Armenia is the only state that economically bridges Eurasia and Europe. And we would like to continue in the same way. The third factor is the one I’ve mentioned already: We are a global nation. And that global nation in the 21st century is fully involved with the country, involved in a way that even during the revolution, which was not a revolution of the classical style – with political party, organization, demonstration – it was something of the 21st century. Participants were not only the citizens of RA, but also Armenians who live in Argentine, France, United Kingdom, Beirut and Madrid. The whole Armenian nation, which makes around 12-15 million, was engaged in the process of political change. That same people can and will be engaged in the industrial revolution and Armenia’s economic development. The fourth reason that I would like to emphasize is the importance of education. It was known during the Soviet era that Armenia had a very high level of education. It’s not an accident that along with very good universities, along with research centers for physics, chemistry, and biology, in Armenia, in Burakan there is a world-famous center of astrophysics. That tradition continues now, and we are proud to say that we have fantastic educational centers in Armenia and even export new educational ideas and topics to the West. Just a couple of weeks ago, in Paris the TUMO center was opened which provides extra-school and digital education. This is the avant-garde of the 21st century, the way you teach children to become IT experts. Education matters. And then, of course, stability of the economy. Last year, Armenia showed around 7.5 percent of growth. We had a revolution this year, but we are going to show more or less the same result. So, nothing changed. There was a big political change but the economy has remained stable. Armenia has probably the best financial and banking sector on the territory of the former Soviet Union. There are European, Lebanese, Cypriot, Greek, Iranian banks; international banking system which is again very stable. Armenia is economically and financially stable country. When you look at the sectors - mining, agriculture, or tourism, the new government is looking for sustainable and clean mining, natural agriculture. We are striving to increase the number of tourists for several times. At the conclusion of this speech, the President invited to make investments in the New Armenia, the Armenia of the 21st century. 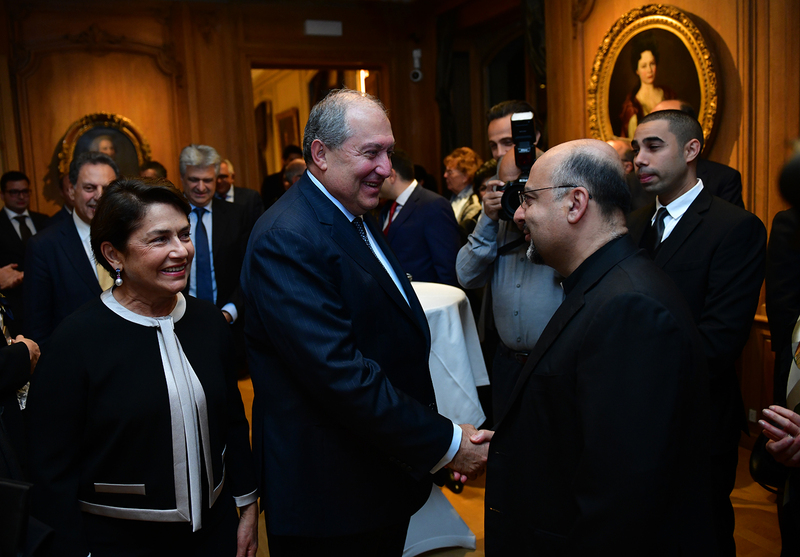 In Geneva President Armen Sarkissian met with His Holiness, Catholicos of the Great House of Cilicia Aram I. 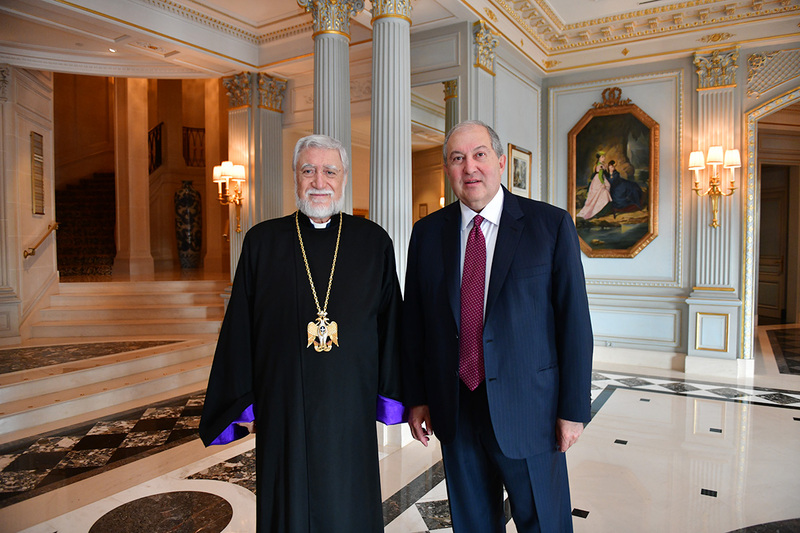 President Sarkissian once again congratulated him on the 50th anniversary of his spiritual mission, wished him health and long years of service. 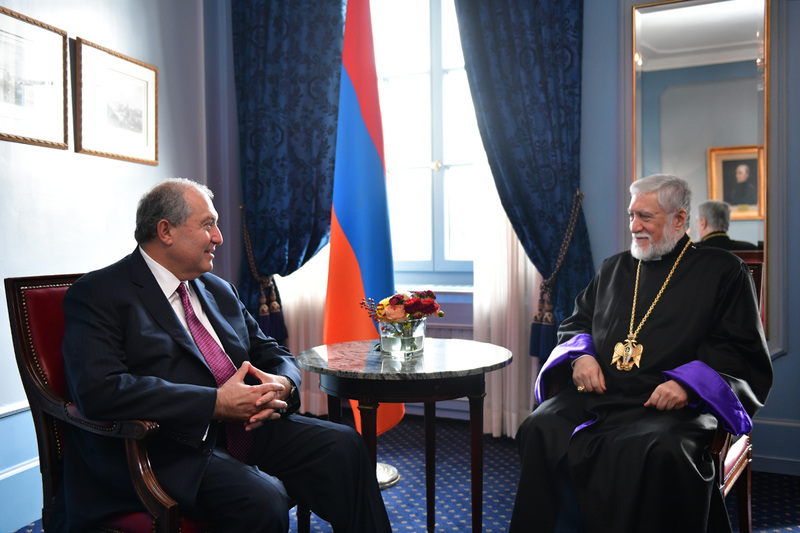 “For fifty years, you have been serving devotedly our Apostolic Church, our Fatherland and the entire Armenian nation,” the President said and expressed confidence that Aram I has yet many things to accomplish because Armenia, Artsakh and Spyurk need his active work not only in Antelias, different centers of the Armenian Apostolic Church but also in the framework of diplomatic and political resolution of the Armenian issues. The President expressed confidence that just as 50 years ago, today too and in the future, Catholicos Aram I will serve the Church, Fatherland, and our nation with the same vigor, spirit and youthful agility. Catholicos of the Great House of Cilicia expressed thanks for the wishes and noted that Fatherland, national, cultural values, the Armenian Cause have always been the pivots of his fifty years long service. In his turn, Aram I hailed services rendered by the President to Fatherland. “President of Armenia, prime minister, those who serve Fatherland are, in a certain way, apostles, those who have a sense of duty.” His Holiness said Armenia must be on the first place for any member of the clergy. 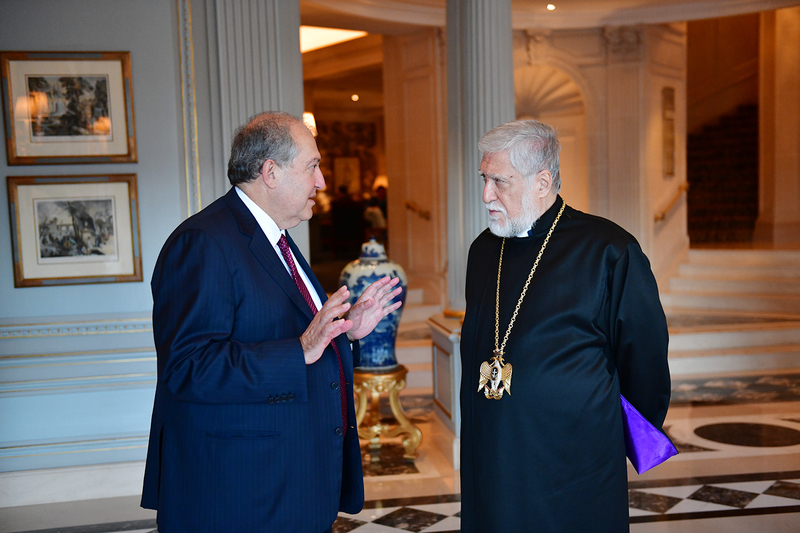 “I assure you that I will continue to serve Armenia and the Armenian people with the same dedication and a greater vigor,” Catholicos Aram I said. 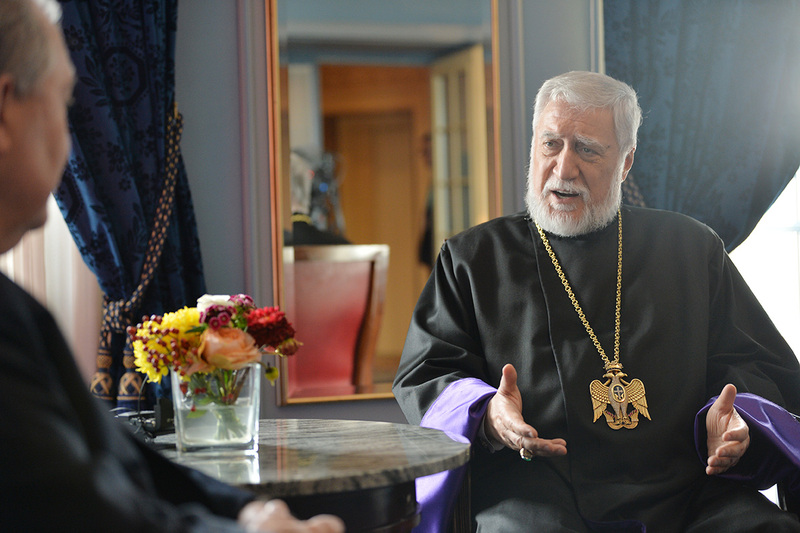 The President and the Catholicos of the Great House of Cilicia spoke about the role of the Apostolic Church, defining it as one of the axles of the national identity. According to Catholicos Aram I, in the absence of statehood, the Church was our spiritual Fatherland, and State-Church relations and cooperation have always been close. “Naturally, each of them has different functions, however, in the end they cross at one point. That point is the nation, Fatherland. Thus, I believe that in Armenia and in Spyurk cooperation with the Church should be unconditional and comprehensive. Fatherland belongs to us all, and we own to the empowerment of Fatherland". 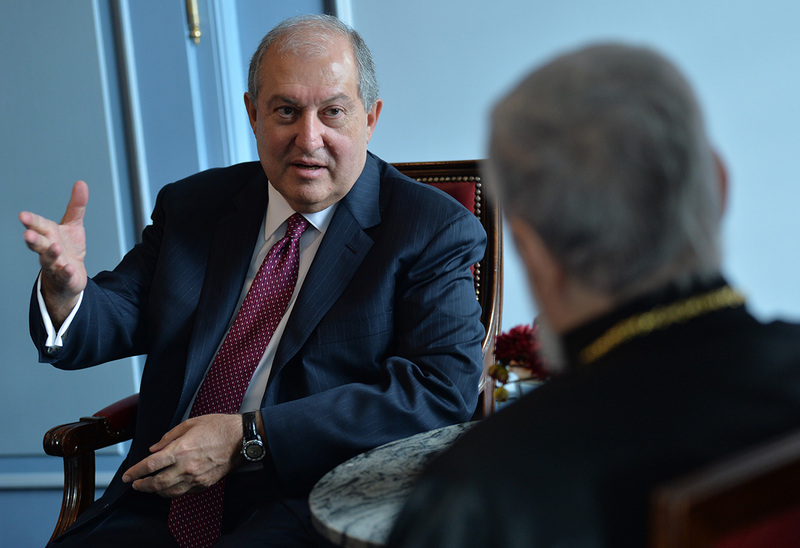 President Armen Sarkissian once again thanked His Holiness for his devotion. 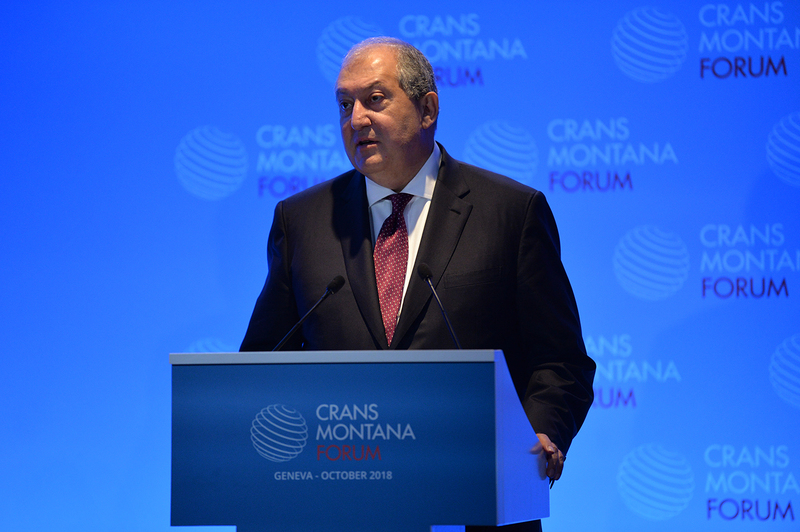 President Armen Sarkissian participated at the annual session of the “Homeland and Global Security” conference of the Crans Montana Forum in Geneva, Switzerland. 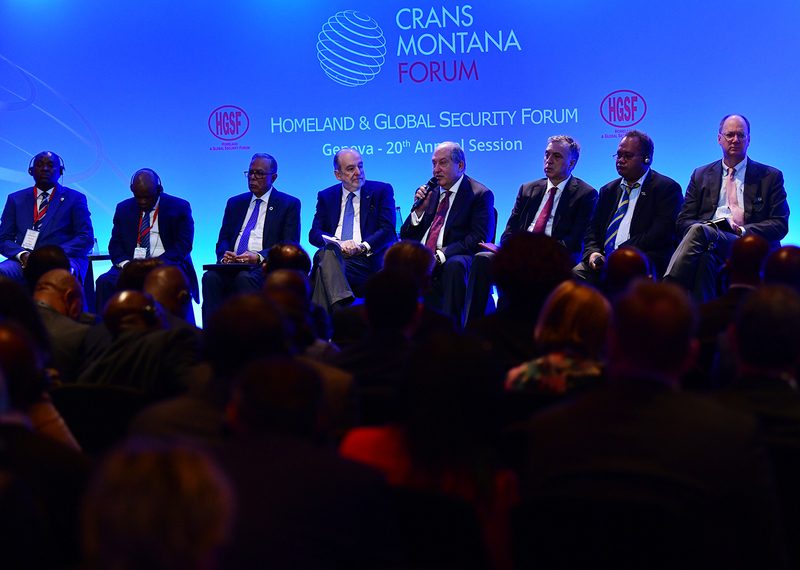 The Crans Montana Forum is cooperating with the UN, UNESCO, EU, NATO, EC and other international institutions and aims to encourage international cooperation. 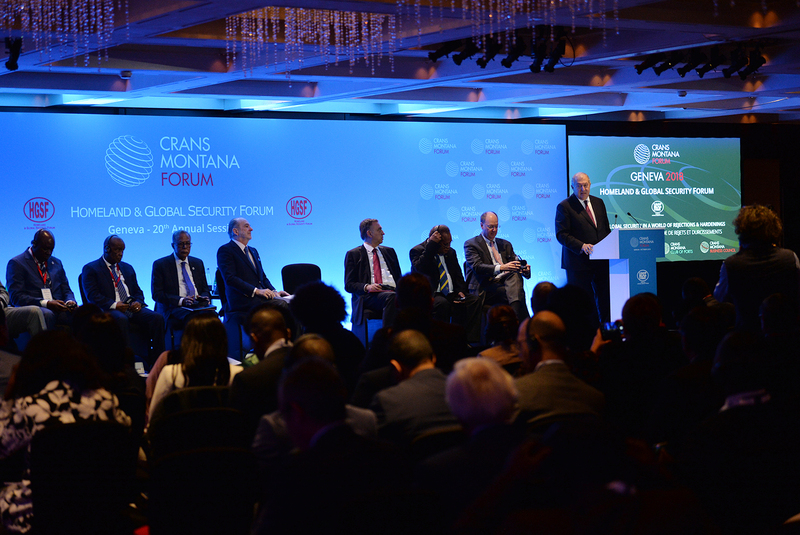 Four events are organized annually in the framework of the Forum which brings together key players from over 100 countries to discuss in an informal setting important social, economic, and security issues. Discussion topics of the annual session of the Conference, which this year is titled “Homeland and Global Security”, are current issues of international relations and risks, healthcare, cybersecurity and information administration. 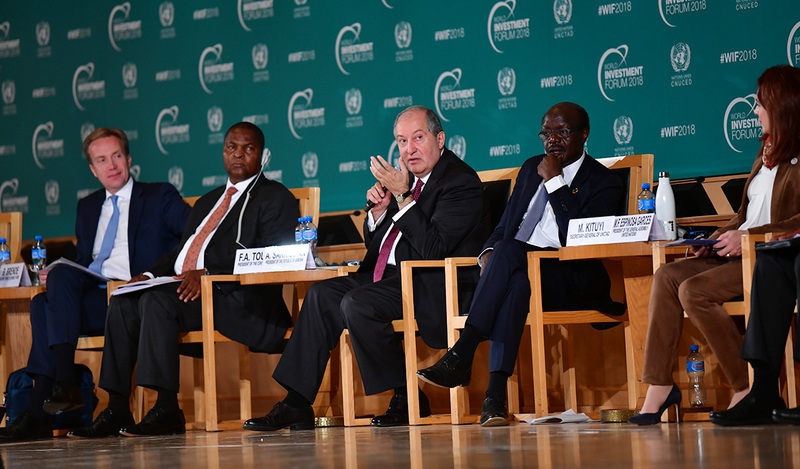 At the session, President Armen Sarkissian made a statement in which he spoke in particular about the importance of finding new ways to address new global security risks. 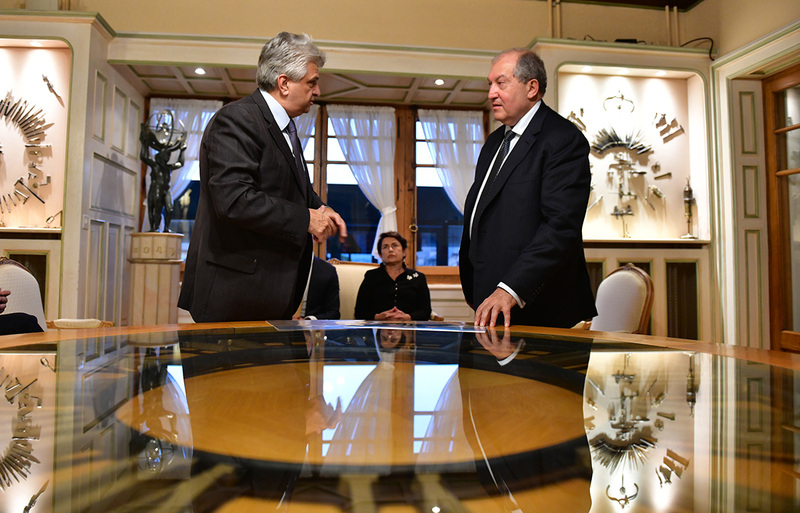 “Today, we are standing at the crossroad of the history of civilizations,” President of Armenia said. “It’s a crossroad where the old paradigms, old ways of looking at human society, or classical ways of handling global risks are not effective enough. I call all this a new era, the era of quantum risks, quantum security and quantum politics. 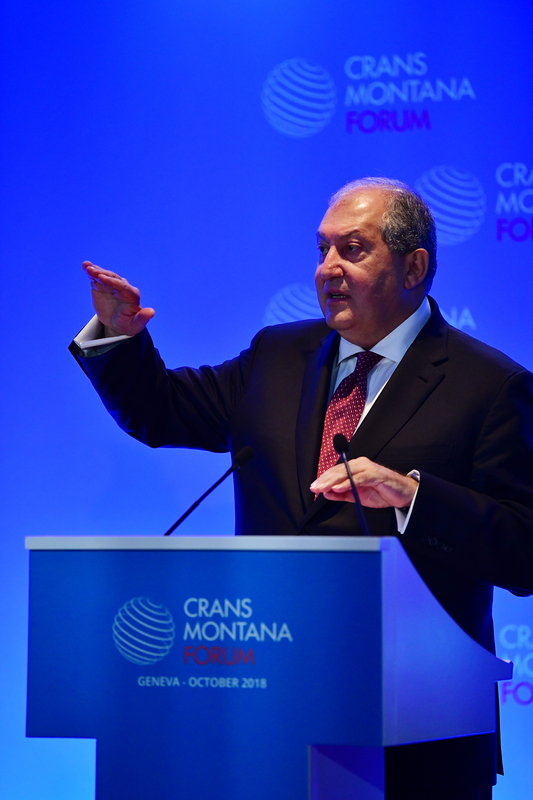 According to President Sarkissian, “To understand historically future 50 or 100 years, we need to look 50 or 100 years back to understand where we are heading. Mathematically it means in order to continue with the line of development of history, we need to have a historic line, and then we should continue and make prediction on where we are heading to. To simplify, let me take four activities of humans: science, technologies, human body, and human society. It is obvious for everybody for the last two hundred years we have had tremendous achievements in the area of science. And I am speaking from Isaak Newton, Maxwell to the great scientists of the 20th century, like Albert Einstein, one of the founders of quantum mechanics and so on. Their discoveries are related to new technologies, new industrial revolution and changes within human society. The second is the thing we call industrial revolution. It is very important to understand that whatever we call industrial revolution is in reality not revolutions but evolutions. And that evolutional curve, which at the very beginning was slower, at the end of the 20th century and beginning of the 21st century dramatically went up. At the initial period, 100 years was required to introduce big difference in simple people’s life. Another change started 50 years ago, and next was the fourth industrial revolution which actually was not a revolution. In 25-30 years, we saw that our lives have changed so much that we called it a revolution but in reality it was a recognition of a fast evolution. The fourth element of our activities is the human being. I would like to bring this example: only some weeks ago, the Nobel Prize was awarded to two scientists – one from the US, the other from Japan for their wonderful discovery on cancer treatment. That discovery is the result of many scientists’ 50 years long research, they found a way on how our immune system should recognize cancer and fight it. It will have a tremendous impact on human lives. In due time, it will have its tremendous impact also on the fourth line, on which I would like to speak briefly – the human society. If we step back, we will see that science and industrial revolution had tremendous influence. It allowed to move from feudalism to capitalism which at that time was the driving force behind the growth. But at the same time, simultaneously started a process which was dealing with social justice, equality. We call that process socialism. The world started to divide between capitalism and socialism or communism which existed in parallel until recently. A new phenomenon, which is on the rise today and which is more related to social justice and equality, is civil society. Individual voices of citizens now matter. Because of that the entire world is becoming more and more quantum. Individual voices can have a great influence on politics. 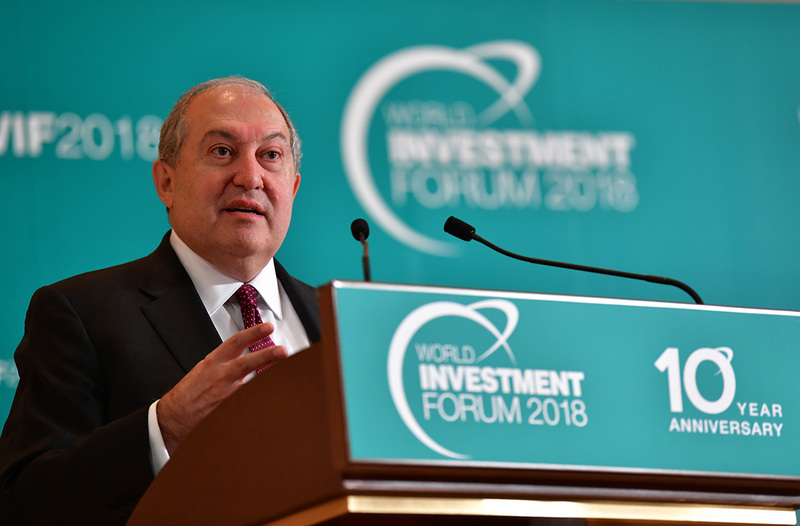 In his statement, the President referred also to terrorism and the fight against it: “Terrorism is a global risk, - President Armen Sarkissian noted. “Can we send troops all over the world to stop terrorism? The answer is no. I think we need to change the environment. We need to find new ways to fight terrorism. New ways to fight against epidemics because it’s not a classical epidemic. Today it may start in Hong Kong, the next victim is in Argentine and not in the neighboring Chine because we live in a globalized world. This is also a new period of globalization because globalization will not stop. Today, it’s moving even faster but along with that we are witnessing the rise of civil society. 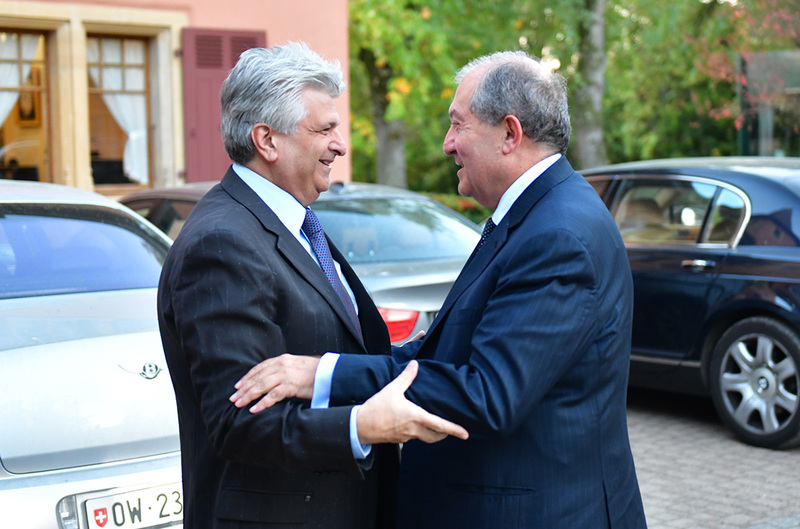 The President of Armenia noted that the 21st century is a century of global security, stability, new policies, quantum stance of our societies, as well as a new century of risks and security which will begin in 2020:” We are standing at the gates of a new world, and we need to change our mentality, our approaches regarding the system of values,” President Armen Sarkissian said. “For me, Armenia is the example of a country which lives in the 21st century because we reflect current tendencies existing in the world. We are a small country but a global nation. As many Armenians live in Russia as in Armenia. Yerevan – one of most ancient cities of the world, which is 2800 years old, has Armenian population which equals that in Los Angeles. In a number of areas, such as information technologies, banking system, Armenia is among the leaders the world. 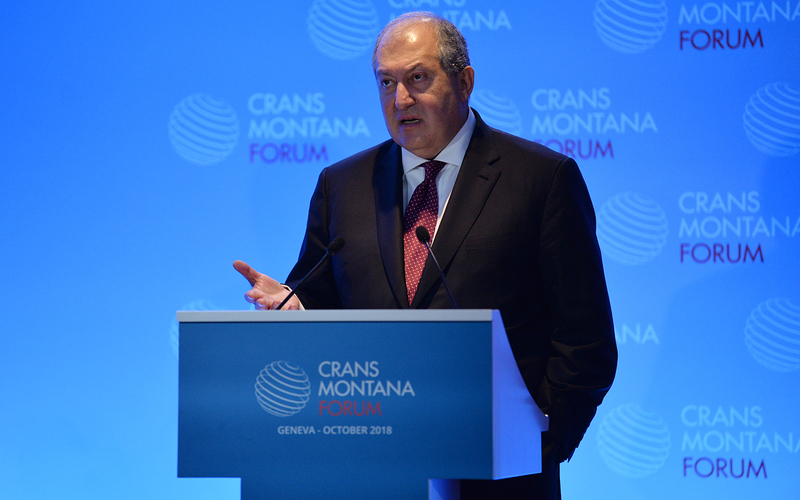 Thus, as the President of a small country, I am trying at the same time to be the leader of a global nation,” President Sarkissian concluded.